But in the 18 years I have been covering the arts in our city, I have found the orchestra to be behind the rest of the entertainment industry when it comes to considering the extra-musical needs of its audience. Ironically, it owns an outdoor venue, Riverbend Music Center, where it presents a contemporary music series, which is experiencing record ticket sales. From the outset, patron amenities and continuous upgrading of the grounds (they recently added a second smaller stage) have been an important part of the “vision” that retains the ticket-buying public. That attitude has lagged behind in the orchestra’s home, and ongoing discussions to update the hall have been complicated by its ownership, the other tenants, and now, the economic slump. Orchestras still have not fully realized their potential of being a destination, and of setting the social tone for a city. People attend the symphony for different reasons, where it is to be enlightened or entertained. I believe that they do want to feel as if they are attending an event, and many really do want to see and be seen. For those who may feel ambivalent about hearing an all-Bartok concert in their subscription series, it may be the welcoming atmosphere that keeps them interested and willing to subscribe again next season. Over the years, I have taken myriad friends and relatives to the symphony. 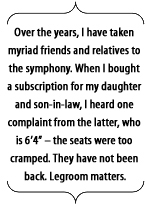 When I bought a subscription for my daughter and son-in-law, I heard one complaint from the latter, who is 6’4″ – the seats were too cramped. They have not been back. Legroom matters. When it comes to inviting friends to the symphony, there is also the dilemma of the music education barrier. I’m not talking about teaching children in schools, although that is a dire problem for orchestras. But even high-level executives, such as my friends who oversee multi-million dollar projects at G.E. and Procter & Gamble, as well as the physicians who save lives at Cincinnati’s world-renowned medical center, have a very real fear that they are not knowledgeable enough to attend the symphony. In those days, 35 years ago, the orchestra had a committee of 1,300 women who poured tea, organized themselves in ticket-selling precincts, conducted marketing campaigns, went door-to-door and made calls. The orchestra’s home, an immense 3,400 seats, was usually full. Of course, times have changed, more women work, and the idea of a “women’s committee” is an anachronism. But we had a name, a face and a phone number to call. It was like having your own personal shopper. Someone was looking out for you. When the orchestra moved to telemarketers in the early 90s, one important volunteer told me, “We were fired.” Attendance began its downward slide, no doubt for a number of reasons. We had those seats for 30 years. Clearly, the orchestra is doing everything right – except getting the word out. Despite her Internet expertise, Dr. Sharp would never have heard about the concert had she not learned about it from a colleague at work. She told me she didn’t know about it, despite prominent advertising in the newspaper. Ah, newspapers. In ten years, will 20- and 30-somethings even remember what they were? With the print press imploding before our very eyes, I worry about all of the arts organizations that I cover. How will they advertise their product at a time of dwindling space for arts coverage? With our own reduced staff, which has endured rounds of buyouts, layoffs and now, furloughs, we are already making choices between printing a preview story or reviewing the event – rarely both. My own time is now divided between classical music, visual art, jazz and pop, and anything else that lands on my desk. I also take my turn working the metro shift, manning the police scanner, on Saturdays. And of course, I have a blog. The arts will need a new grassroots program, like the CSO Women’s Committee. Perhaps in the future, the new “personal touch” will mean Twitter and Facebook. Already, I see organizations using these tools, a smart idea, I think. But will that reach everyone? I do not know. My most rewarding experience taking someone to a concert happened a few months ago. I took a special little girl to her first concert, a “Lollipop Concert,” in Music Hall. Katie, 2 ½ was enthralled, not only by the music on a “bug” theme, but also by the student ballet dancers who participated with the symphony. She stood by her chair and imitated them. So, I thought that taking her to “The Nutcracker” the next month would thrill her even more. But when the curtain rose, she loudly announced, “I can’t see the orchestra.” She wasn’t content until later, when we leaned over the pit and she could see the musicians. I think I have planted a seed in the next generation of concertgoers.